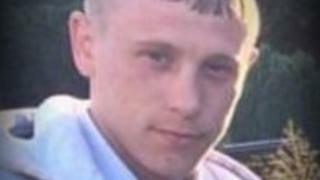 A man has been charged with murder after a 22-year-old man died from knife wounds. Patrick Hill died in hospital on 13 February after being found at an address in Coventry during the early hours of Sunday 10 February. Levi Whitmore-Wills, 18, was initially charged with wounding, but was charged with murder on Monday evening, West Midlands Police said. He did not deliver a plea at Birmingham Magistrates Court earlier. Mr Whitmore-Wills of Brinklow, near Coventry, was remanded in custody ahead of his next court appearance at Warwick Crown Court on 21 February. Det Insp Hannah Whitehouse said: "This was initially treated as a serious stabbing but we're clearly now looking at a murder inquiry after the victim succumbed to his injuries. "We understand a disturbance took place at Albany Court - a multi-occupancy property - in Brunswick Road between 02:00 GMT and 02:30 GMT. "I'd appeal for anyone who heard a disorder or saw anyone acting suspiciously to call us as they may have important information."